In my last post, I spoke about a method I use to help me market effectively on Instagram: being a customer and following my favourite accounts. In this post, I want to share with you 5 of the most valuable and proven marketing methods I’ve learned from following my favorite accounts, and how you can apply these methods to your own Instagram page to boost followers, engagement and ultimately help you draw in new customers to your business. You don’t have to follow all of them; like I always say with Instagram, experiment and see what works. See what your audience likes and do more of that. Have you noticed on Instagram and Facebook ads how boring and identikit some of the promotions are getting? I have. This is typical in an industry where people start seeing a method that is working well for one marketer, and attempting to mimic that success. The thing is, social media is one big, crowded, noisy place. And the best way to stand out in a big, crowded, noisy place is to, well, stand out. So I’ve named this method the neon green method, because it’s about designing your Instagram posts to stand out on Instagram from everything else around you. And I don’t literally mean you should make your posts neon green, by hey if that’s your branding scheme then go for it! I just mean that don’t be afraid to step away from the beautiful, artistic, pastel, arty shots on Instagram and instead do something a bit brash, loud, quirky, or odd. Different is good. If you want your brand to be noticed on Instagram, be “neon green” in everything you post. Maybe some people might not like it, but you’ll definitely be remembered. Have you ever been so “sold” by a promotion that you just want to jump in and say – oh my god, where do I sign? Sign me up now! Wouldn’t it be great to have a business where your fans love you so much, that as soon as you release a new product or service they are emailing you to tell them what your sales page is? That’s not as much of a fantasy as you may think. If you can get a loyal following, that type of customer behavior is well within your reach, and Instagram is one of the best ways you can start to generate that really loyal, dedicated following. 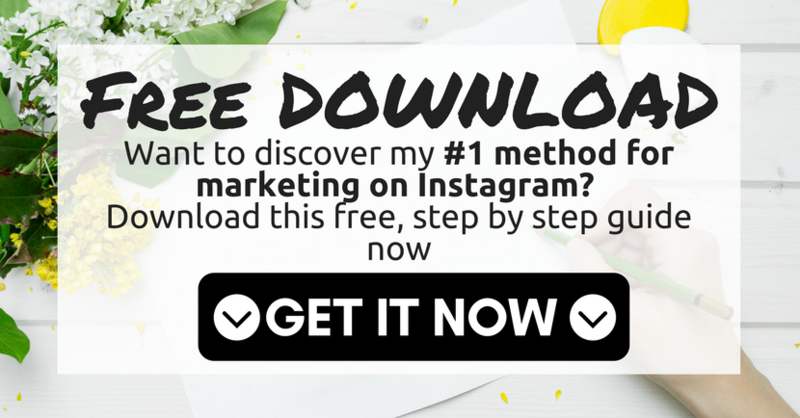 So here’s what I recommend to make your followers on Instagram love you so much, that they are emailing you before you release your next product, asking you how they can sign up. 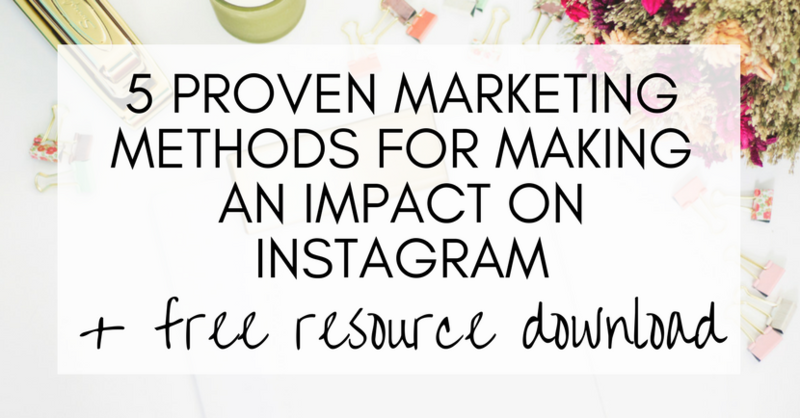 Make your free content on Instagram as good as the paid content other people sell. It doesn’t matter what business you are in, this is a completely achievable goal. It’s not just value that’s important here, it’s quality too. If your posts are high quality, your followers will assume that everything else you do is just as high quality. Likewise, if you give little time or thought to your posts and the quality of them is typically low, what are your audience going to think when you put an offer in front of them? Will they snap it up? Or will they think that it’s going to be the same poor quality as your posts? So consistent, quality posting is going to go a long way to building you a loyal following. And remember, quality doesn’t have to be an expensive, artistic shot on a pricey camera. It’s not about your artistic skills, it’s about the value you are giving your audience. If you are on Instagram and trying to build a large audience on it, start thinking of yourself as a celebrity. But I don’t want to be a celebrity, Lauren. Neither do I. But that’s not the kind of celebrity I mean. Fame comes in many forms, and if you want a loyal and passionate Instagram following, you should aim to be “famous” amongst your following. As I mentioned in the previous method, you can do this by consistently providing quality content. But you can also become famous by understanding how you are viewed by your audience, connecting with your audience in a personal way. And this is about understanding exactly what it means to be a “celebrity” in your niche. A little known fact outside my close circle of friends is that I have a keen interest in politics. Ok. I know it’s not everyone’s cup of tea. But I love it. No more so than when the UK recently went into a kind of politics meltdown after the Brexit vote (I’m British, if this is the first time you’ve come across my blog), during which time it was easier to keep up with the news on Twitter than it was on normal online news outlets. I follow quite a few journalists and news reporters on Twitter. These aren’t celebrities per se, but in my little world of politics they are. I know them, read their articles, and value what they have to say. Be under no doubt, if you are doing all the right things and gathering a loyal Instagram following, that’s exactly how your followers view you right now. So even if you don’t want to be a celebrity, in your own niche, the truth is you are. Embrace it. So returning to Twitter and politics. Political geek that I am, when a noted economist or journalist retweeted me, replied to a comment from me, or quoted me, I kind of got star struck. (I know, I’m a geek). But the point I’m making here is that I valued that personal contact from these people that had huge followers, who didn’t have to reply to me, but did. And your audience will value that same personal contact from you. So allow your audience to become star struck with you. Be that celebrity. Capture and capitalise on your celebrity status. Take the time to comment on their posts, follow them, reply to their comments, and tag them (use that one sparingly, when you already have a relationship with that person). I cannot stress enough how much they will value the time you are taking to connect with them on Instagram, and if that person is following a hundred similar accounts, I guarantee yours is going to be the account they remember and love the most. Trust me on that. Mummy, can I have three stories tonight. No, it’s late. Just the one. Can I have three stories. Three. Three. Two. Can I have two stories. Two stories. Oh go on. Just two stories. Look. You can have one tonight and three tomorrow night. Other parents reading this are probably nodding right now in familiarity. Now, toddlers can be incredibly annoying. And obviously I’m not suggesting you annoy your audience. But toddlers also have an unbelievably good technique at getting what they want. Look back at that conversation. Who had the upper hand? I might think I did, because she only had one story that night. But look what she got out of it. Three stories the next day. Wow, those toddlers can negotiate well, can’t they? But I want to draw your attention to a few things that toddlers do that are relevant to how you use Instagram. No, seriously, I do. For you parents out there, answer me this: does your toddler ask you for something once, or ten times? Correct answer. Fifty billion times. Obviously, this is an annoying characteristic of toddlers, and please don’t go on Instagram and start asking your audience to buy something off you fifty billion times until you completely wear them down and they unfollow you. However, many Instagram accounts underestimate the importance of repeating a request to your audience. I know what you are thinking: I can’t ask them the same thing more than one. I’ll annoy them! No, you won’t. If you can be smart, unique and authentic with your promotions, your audience will not mind hearing about it more than once. In fact, most people need to see a promotion several times before they make up their mind about it. And it’s effective for the same reason toddler requests are effective. Even if you don’t give in to a toddler, you’ll remember it. And even if you can’t say yes that time, you might find it’s something you agree to at a later date (similarly, people who can’t buy your product now will still remember the promotion and may be looking to buy it the next time you launch). The main lesson here is to not be afraid to promote yourself repeatedly. Don’t be annoying, but be professionally persistent. If you are in the business of transformation, this is one for you. If you’re on Facebook, you’ll be familiar with those posts you occasionally get along the lines of….a year ago today, you posted this. In my case, it’s typically a picture of one of my children looking really tiny and young, and me thinking: oh my god, look how small they were! Instagram has a very popular hashtag called #throwbackthursdays or #tbt. It’s clue is in the name. It’s a chance to post a picture of you in the past, with a short explanation of how you have changed since then. Health and fitness accounts use this very effectively, especially the weight loss ones, as it’s a chance to post the “before” picture of what they looked like before they lost weight. Often it’s accompanied with a story about how unhappy they were in their old body, and how their life has changed for the better since then. But you don’t have to be a weight loss guru to use this hashtag. It’s relevant for anyone in the business of transformation and change. If you are helping your audience change something about themselves, then this hashtag is an opportunity for you to show that change in action. For example, perhaps you are a finance expert helping people in debt. Your post could be about looking back to a time when you were struggling with that debt, and the effective it had on your life at the time. This is a very powerful way of connecting with your audience. People seek change in their lives, and they are inspired by other people who have made that change. Instagram is a great social media platform for offering up inspiration to a large audience who are looking for it. So this is your opportunity to share your own story. If you are going to use this type of post, remember to use the hashtag. It’s also a good opportunity to look at other accounts who are using the hashtag, see how they are using it, and what you can learn from it. So there you go. 5 tried-and-trusted methods for getting your name out there on Instagram and building a loyal following. 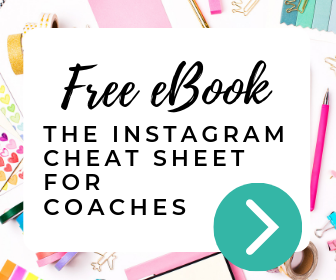 I cannot stress how effective Instagram can be at helping you build a loyal band of followers and customers, just as long as you know some of the techniques that are going to help you get there. So now is the time to put this into action. Start applying these methods to your business, and see what they can do for your business. Plus, drop me a comment below and let me know your thoughts. Are there any good methods you think I’m missed? What’s your favorite method for building a following on Instagram? Tell me now by adding a comment below. 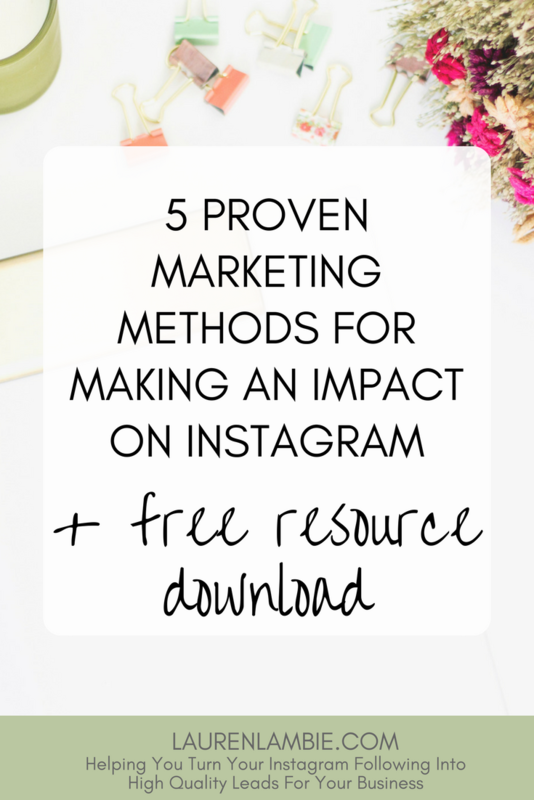 5 of the most valuable and proven Instagram marketing methods, and how you can apply these methods to your own Instagram page to boost followers, engagement and ultimately help you draw in new customers to your business. Thank you Lauren! After reading your blog I realize how scattered and “all over the place” I am regarding Instagram. I am trying to get my act together and your very clear guidelines will really help me. I will keep you posted on my progress!